Several years ago, I visited England out of the blue. My sister lived in Oxford at the time and I found a deal of the century to fly to England for USD $280 from Hong Kong (I was living in HK). I was granted 10 days of vacation from my mother and wife duties. I booked the ticket and flew. We spent the 10 days together as sisters traveling to many lovely places in England. Traveling to places without trying the local dishes is like eating cake without the icing. To be honest, I didn’t expect much regarding the food, but to my surprise, everything I tasted was just wonderful. Out of all the delicious food I tried, this Sticky Date Pudding Cake (or Sticky Toffee Pudding) was the most unforgettable. Well, maybe because there was a memory behind this indulgent treat. It was in Canterbury. We visited the famous Canterbury cathedral and learned some of the great history of England. As we strolled down the street, my sister and I discovered a small chapel of the Church of England. As far as I know the Church of England was established by King Henry VIII of England. There was a worship service underway in the chapel with a small group of people. Out of curiosity we went inside and listen to the sermon for 20 minutes. Anyway, the arguing made us hungry, so we went into a random pub to dine with our feelings still irritated. We each ordered a different dish for dinner and then ate in silence while our tempers simmered. Then, to close a long day of contention with a sweet finale, we agreed to order a dessert to share. 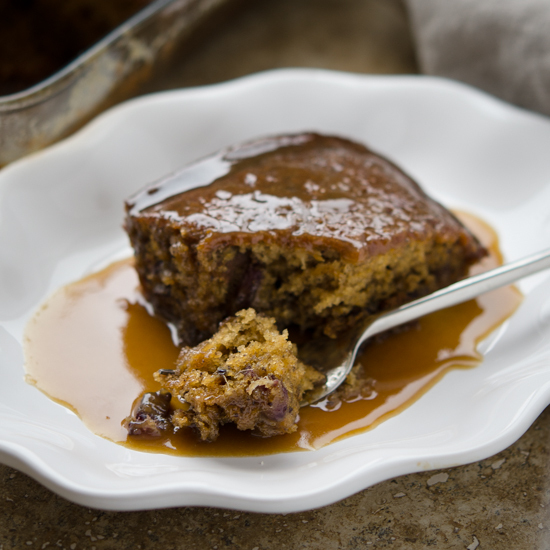 You guessed it–it was this Sticky Date Pudding Cake. Oh, my! It was so good that we literally licked the plate. The melt-in-your-mouth pudding comforted the troubled hearts of two sisters from Korea. And it made us to soften our feelings to each other. As we walked out of the pub, we became the best friends again, forgetting all about the ordeal we had before the meal. As you see, foods do bring people closer together. It gets even better if that involves a sweet treat. Don’t ya think? So here is the recipe. Don’t let the words “date” and “pudding” discourage you. 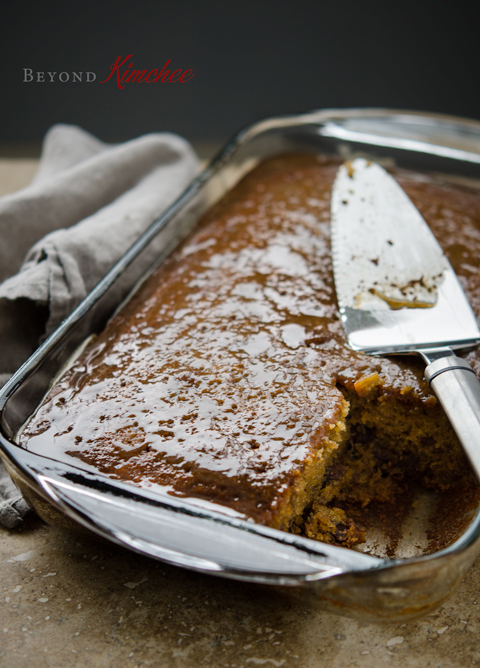 It is a warm, gooey cake that even my picky, chocolate-loving children absolutely adore! Chop the dates into small chunks. Put the dates in a bowl and sprinkle in 1 teaspoon of baking soda. Pour boiling water and let it sit for 20 minutes to soften. 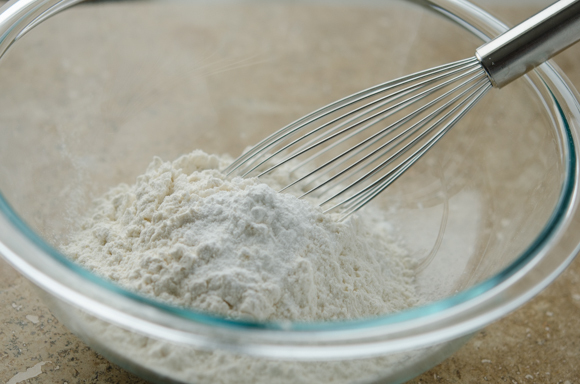 In another bowl whisk the flour, salt, and baking powder together. 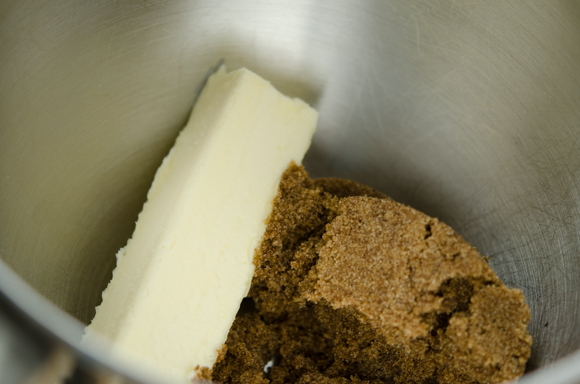 Beat the butter and brown sugar in a mixer until creamy on medium speed. Add the eggs, one at a time, and the vanilla. Beat until creamy and fluffy. Add the flour and mix until incorporated on low speed. Dump the dates and the water they were soaking in into the flour mixture. 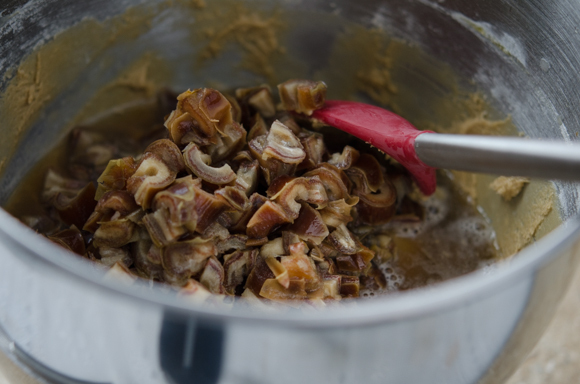 Fold the dates into the flour mixture using a spoon until the batter is just mixed and smooth. 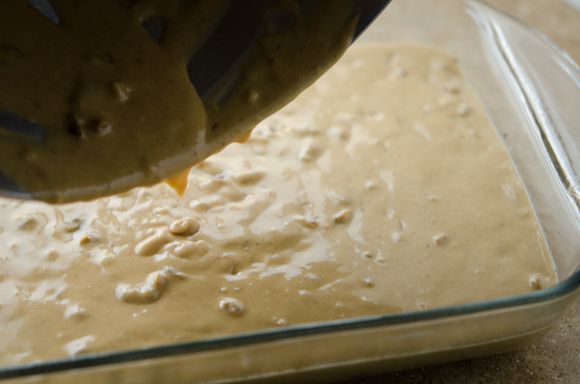 Pour the batter into a greased 7″ x 11″ baking pan, and shove it into a preheated 350 degree F. oven. Bake for 35-40 minutes. 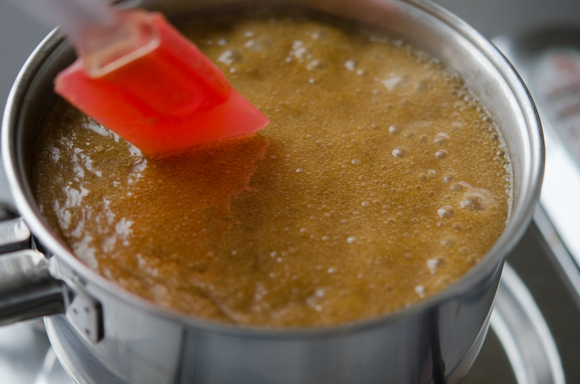 Meanwhile let’s make the caramel sauce (or some may call it toffee sauce). 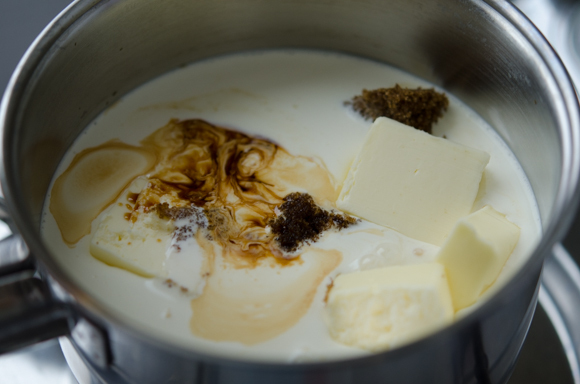 Melt the butter, cream, brown sugar, and vanilla in a saucepan over medium heat. Bring it to a gentle boil first. Then simmer it over low heat for 2 minutes. When the cake is done, poke, poke, and poke everywhere!!! 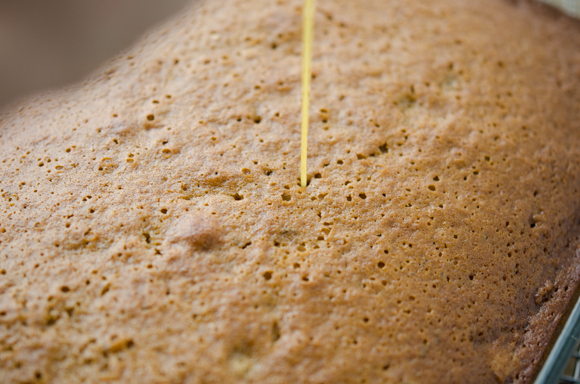 (I used a spaghetti noodle) You are making tunnels for the caramel sauce to permeate the cake. Oh, yes! My dear! Drizzle 1/2 cup of the warm sauce over the warm cake. Reserve the rest of the sauce to top the cake with when ready to serve. 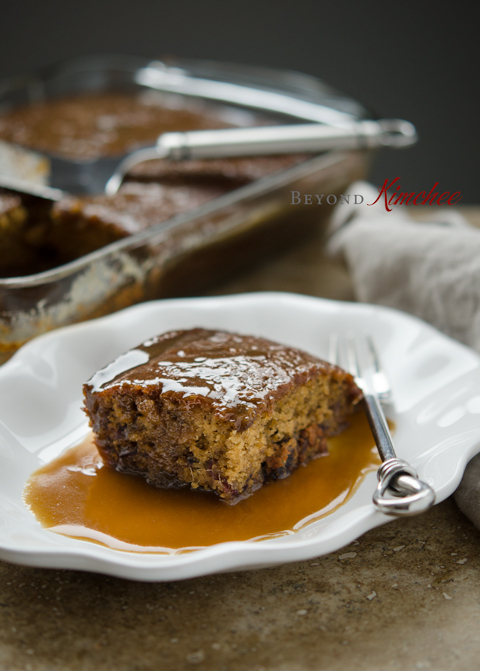 This is a truly comforting dessert for the cold days of winter. If you want an extra luxury, add a dollop of cream or vanilla ice cream on top. You will be flying to HEAVEN. 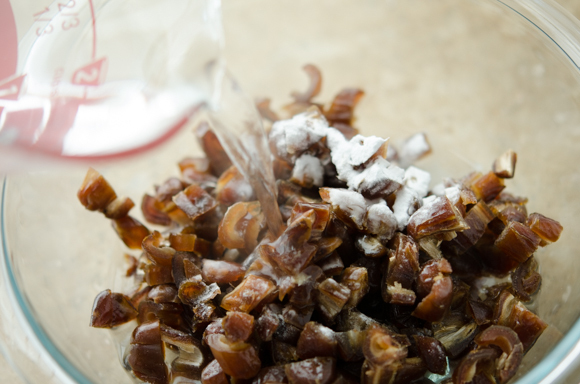 Put chopped dates and baking soda in a bowl. Pour the boiling water over and let it stand for 20 minutes. Another mixing bowl whisk flour, baking powder, and salt together. Set aside. 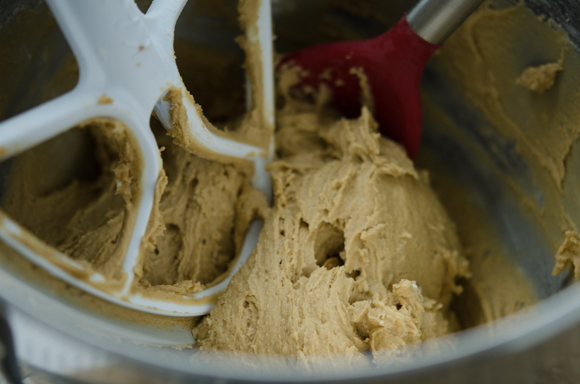 In a electric mixer with a paddle attachment, cream the butter and brown sugar until creamy. 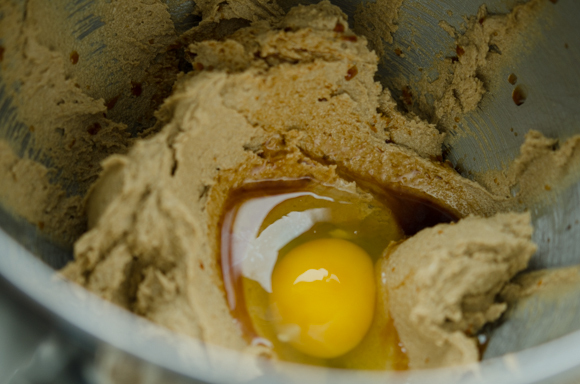 Add eggs, one at a time, and vanilla and beat until the mixture is creamy. Add the flour and beat until combined. 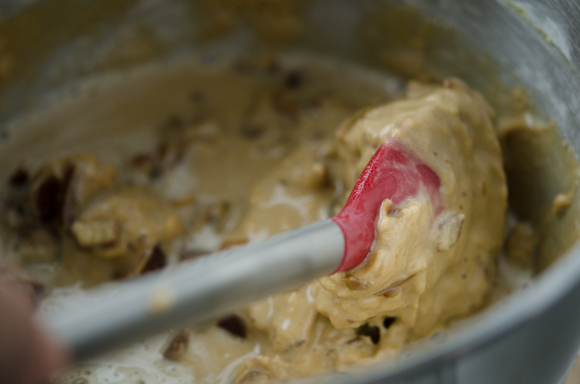 Add the soaked dates and the liquid into the flour mixture and fold together with a spoon until combined. Pour the batter into a greased 7" x 11" baking pan and bake for 35-40 minutes or skewer inserted in the center comes out clean. Meanwhile make the sauce by heating brown sugar, cream, vanilla, and butter in a small sauce pan over medium heat. Let the sauce comes to a boil stirring often. Reduce the heat to med-low and simmer for 2 minutes. When the cake is done, pierce the cake with a skewer liberally. Pour 1/2 cup of the warm sauce over warm cake. Let it stand for 10 minutes. Serve the cake warm with remaining sauce and vanilla ice cream, if desired. I've never had this dish! I've heard of it, but never made it. I really need to -- your version looks wonderful! Thanks for the inspiration! This is a great dessert. You should try it soon. Hi Madeeha You will need to use the brown sugar. 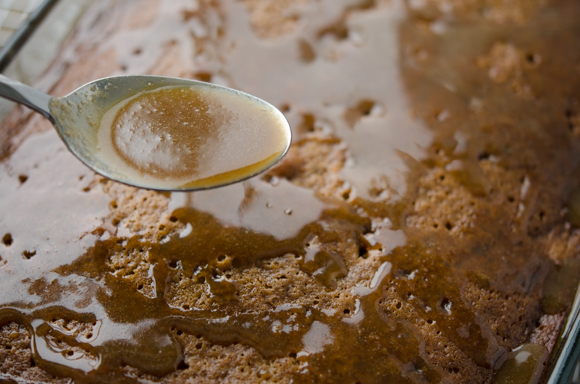 It gives the caramel-like flavor that granulated sugar wont give. Hope you can get the brown sugar for this recipe. Thanks. 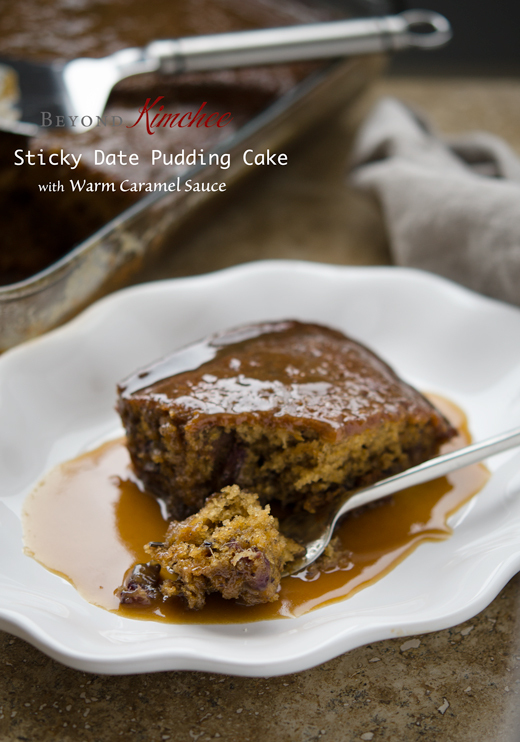 I have always wanted to try Sticky Toffee Pudding. This looks so incredible with all that caramel sauce. Hope you can try out. It is seriously wonderful dessert. You won't regret it. 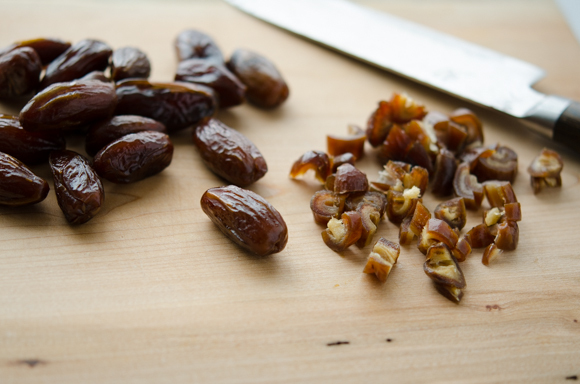 I've made this recipe with raisins instead of dates...and it was delicious. My family loved it. Thanks. Can you let me 1 stick of butter is equivalent to how many grams? I made this cake last night. Perfect recipe as written. My oven’s cook time was 30 minutes. Thanks for the recipe, it’s delicious. And easy.